Ross has been finishing up planning his development roadmap and he'll be sharing it later this week! 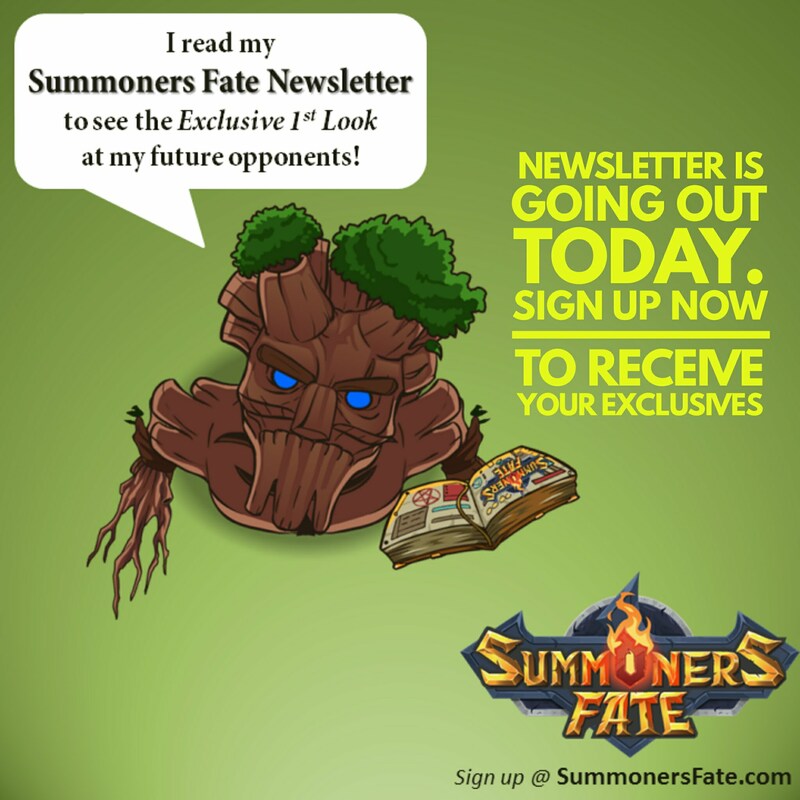 Volume 14 of our digital Summoners Fate Newsletter is going out tomorrow (11/29). If you are interested, click here to sign up. Your team of Ironclad Leader, Fire Sorceress, and Ironclad Warrior look up to you - what will be your first move? 1. 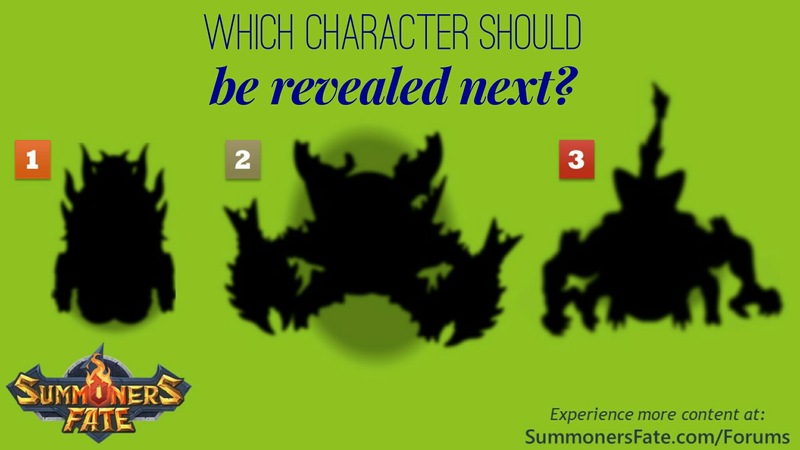 Vote for the character you want revealed next by clicking on the image below or here. Winner will be announced on Thursday, 11/30. 2. 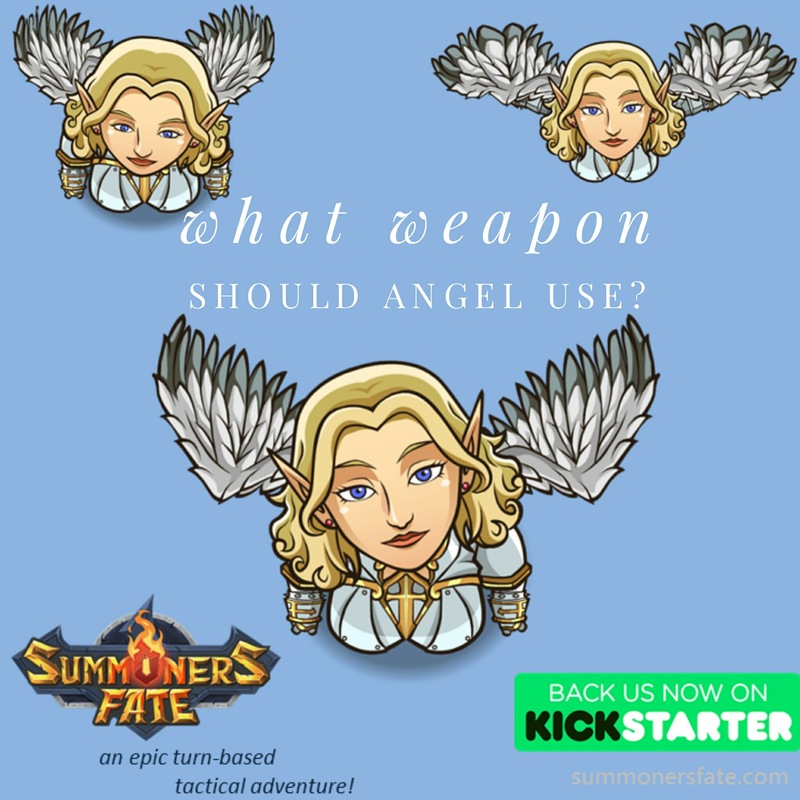 LAST CALL for voting for the Angel's Weapon. The Fire Sword is in the lead, and I will be closing this vote on Thursday, 11/30. I've also adjusted the voting so that if you want to change your original vote, you now can. Click on the image below or here. 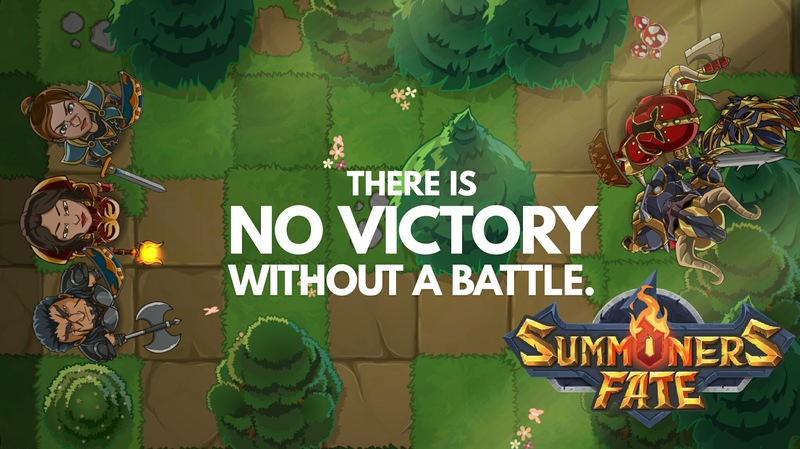 Volume 14 of our Summoners Fate Newsletter went out today. 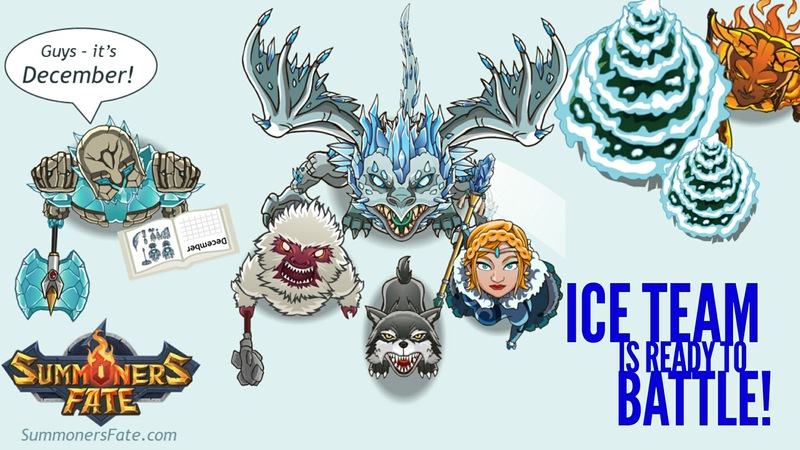 We typically recap the recent posts, videos, and information, do player shout-outs, and give an exclusive 1st look at something not yet revealed in our game. 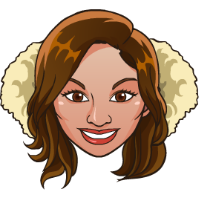 If you are interested in receiving the next Newsletter on December 13th, sign up here. after tallying all the votes across all our social media channels is #2! 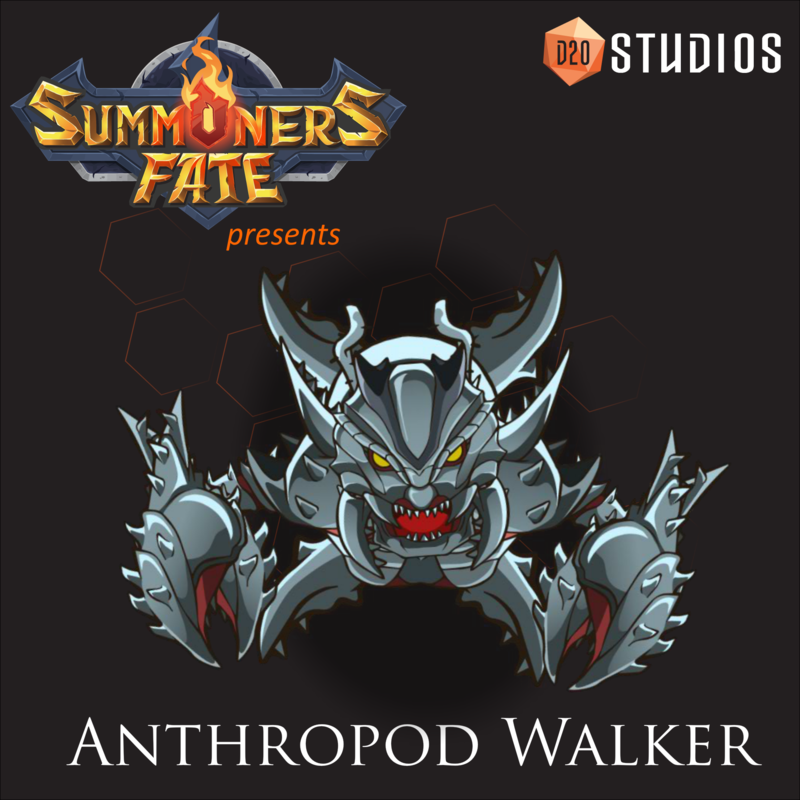 Meet the Anthropod Walker. This nightmarish creature is an insectoid + crab humanoid hybrid that's been mutated by Chaos Magic. With razor sharp, skull crushing pincers, this powerful creature is certain to strike fear in those foolish enough to face against it on the battlefield. Happy Friday! Watch Iron Golem rounding off a complex combo by knocking back the Orc Chief and triggering the bonus attack of each team member. The cold warriors are ready for December & frigid battles! 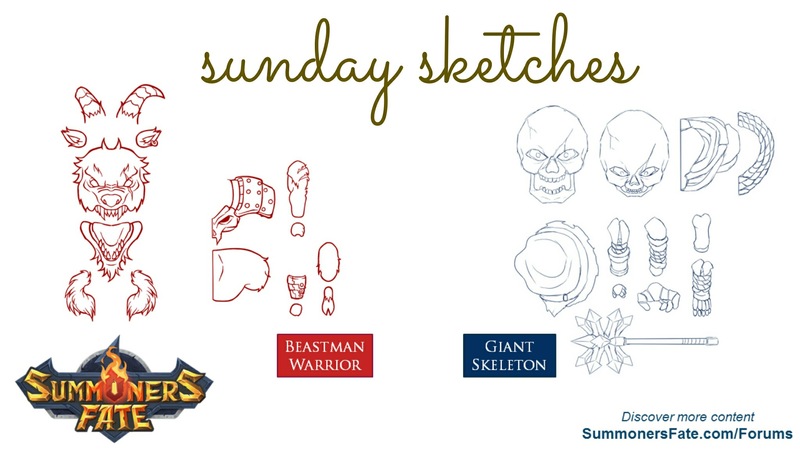 Meet 2 upcoming characters currently in development - the Beastman Warrior (first of this new race we're adding) and the Giant Skeleton (which will be added to our roster of the Giant Race). Kickstarter Backer Surveys were sent out today - check your email if you were a Kickstarter backer! We plan to be transparent about our development process including what we're aiming for and when we plan to deliver it. Ross has put together a Roadmap showcasing our goals leading to the Early Access closed-beta and worldwide launch. Check it out here. 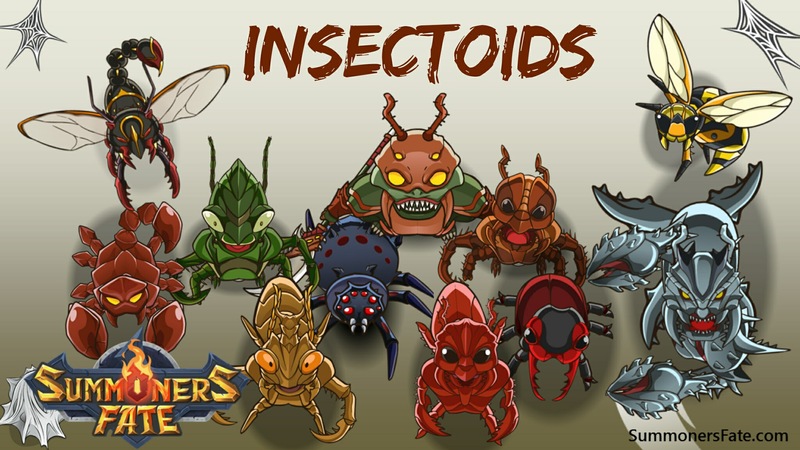 While technically not all "insects," these various creatures are part of our Insectoid race. Can you spot a NEW character? 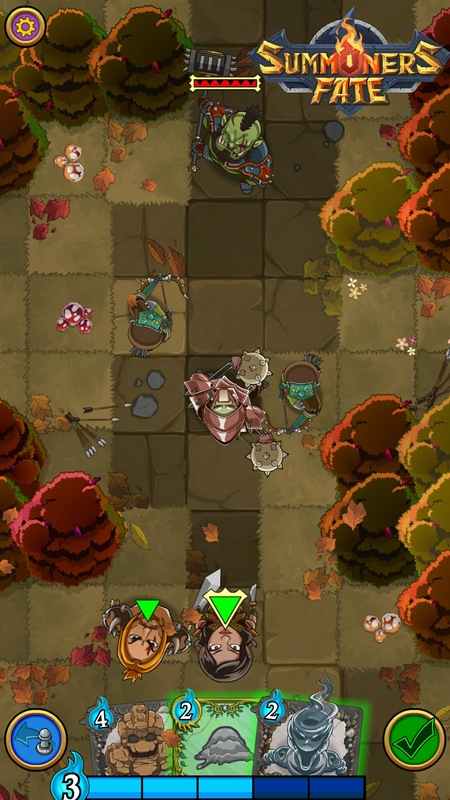 Autumn outdoor battle screenshot. Which side would you rather be on - Orcs & Goblins or Humans with an Iron Golem? 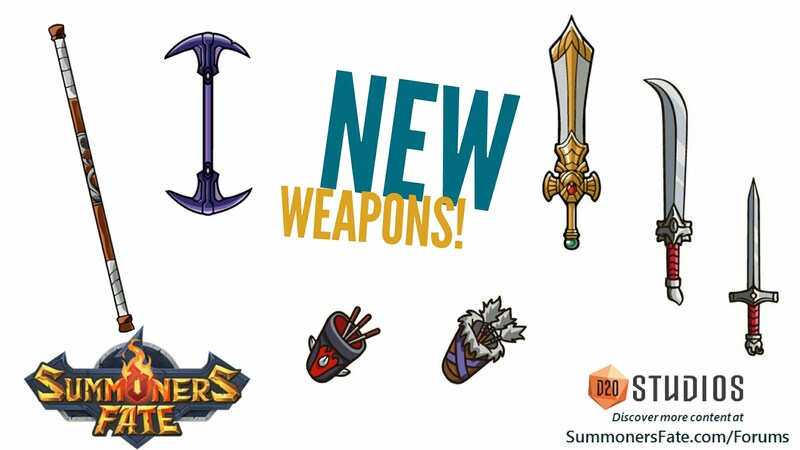 Snapshot of some upcoming weapons, including for our Monk, Arcane Giant, High Elf Warrior, and more! Which of these factions would you favor playing the most and why? Vote here. Learn more about the Marauders here. 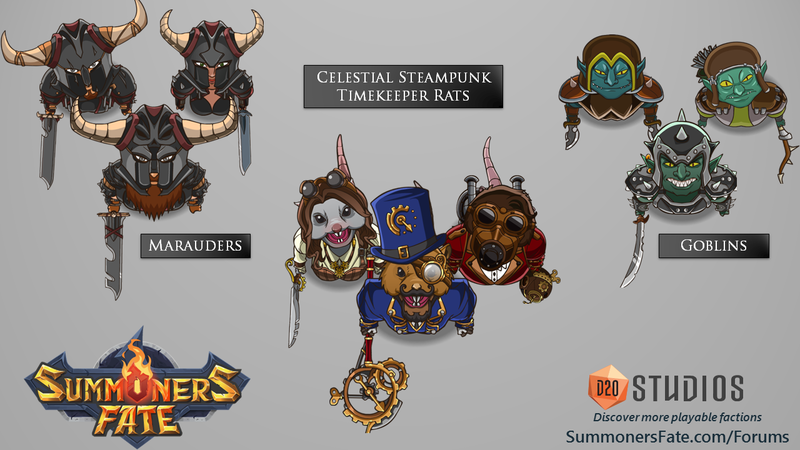 Learn more about the Celestial Steampunk Timekeeper Rats here. Learn more about the Goblins here. 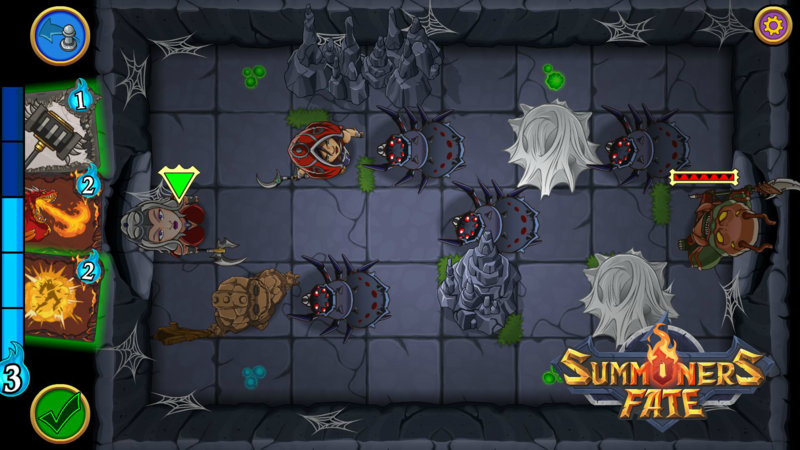 Screenshot Saturday Spider attack in the Blue Cave! New Card or Character Idea? 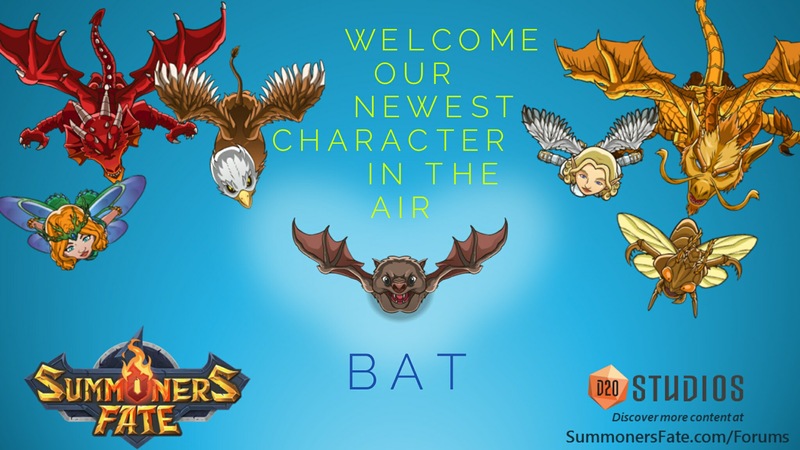 Did you know we have a place on our Forums for sharing new card or character ideas for Summoners Fate? We do! 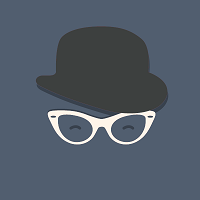 Click here, check out some ideas other players have posted and leave your own! You may see your character or spell appear in Summoners Fate. We typically do a "Sunday Sketch" every week. 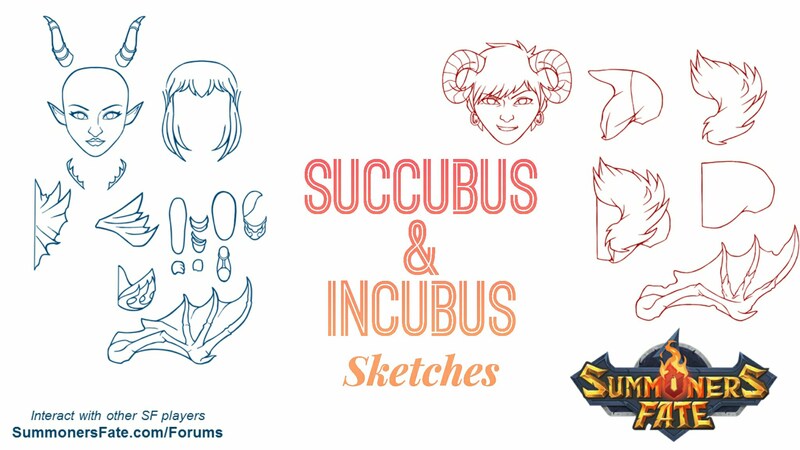 See some of our past sketches here, here, and here! 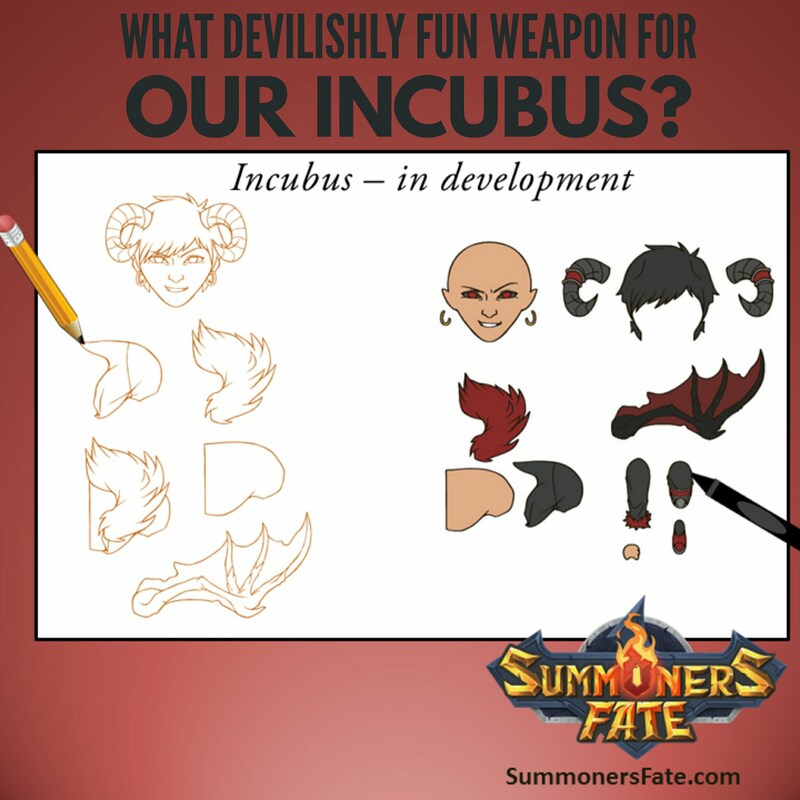 Ross & I are stuck on a great weapon for our upcoming Incubus character. Can you help? 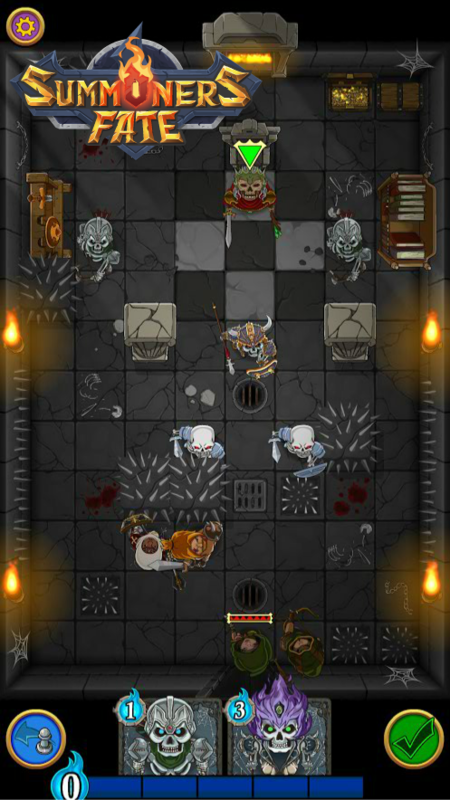 Liche King & his Skeleton army welcomes you...to the spike room of death! Check out the fun and sweet wall spikes in this screenshot.